Canada’s national housing market continued its sluggish performance in the month of May. Despite the warmer weather and usually busy spring selling season, buying activity has been awfully quiet. New mortgage regulations which are now in full swing have stymied fringe buyers, particularly millennials. According to new data from credit bureau TransUnion, new mortgage originations among millennials in Canada fell by 19.5% between the last quarter of 2017 and the first three months of 2018. That has also been showing up sales data. National home sales declined by 16% year over year for the month of May. This marked the worst year over year decline since May of 2008 when home sales dipped 17%. Total home sales of 50,604 marked the lowest total since May 2011. Year over year percent change in home sales for the month of May. Seasonally adjusted home sales edged 0.1% lower on a month over month basis, or 15% on a year over year basis. Either way you slice it not a great month for one of the worlds most resilient housing markets. As sales continue to slide inventory is slowly beginning to build. 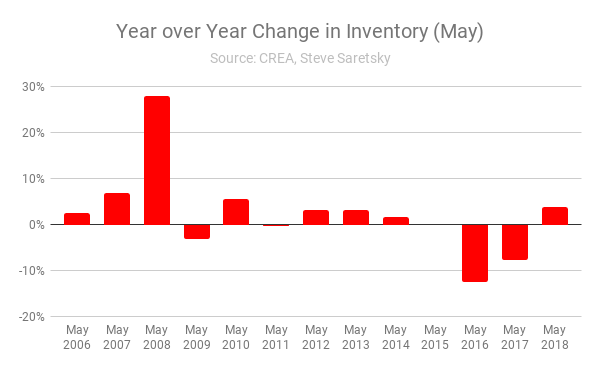 For sale inventory crept up by 4% year over year, increasing for the first time in three years. Year over year percent change in inventory. 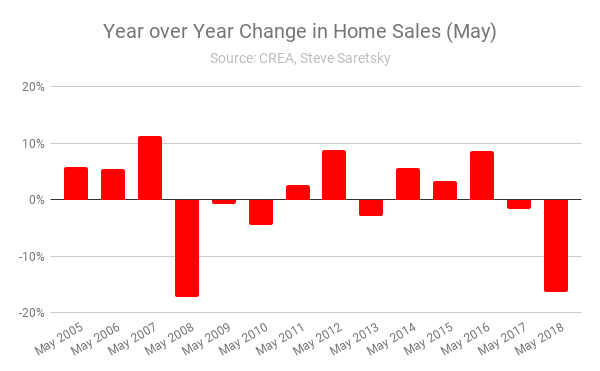 The average sales price dipped 6% year over year in May, not nearly as bad as April when year over year declines registered a head turning 11% decline. 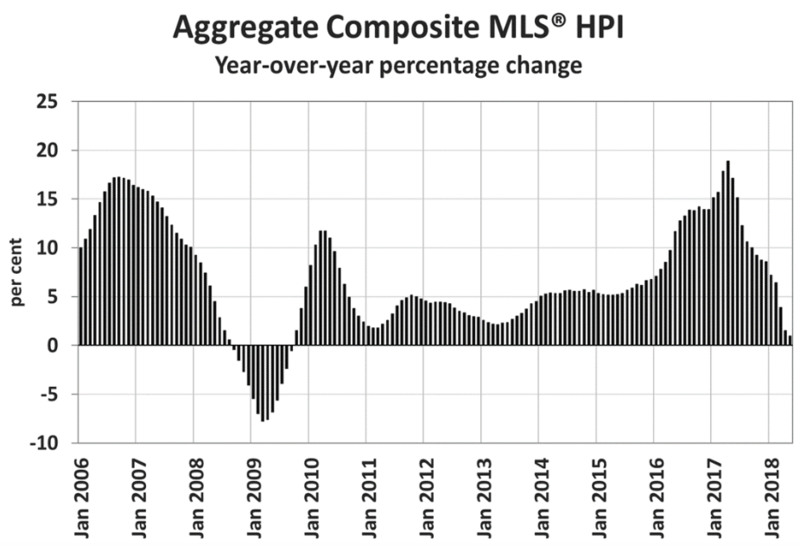 When looking at the smoothed out index of the MLS® HPI prices showed a slight increase of 1% year over year in May. Per the Canadian Real Estate Association this marked the 13th consecutive month of decelerating year over year gains. It was also the smallest year over year increase since September 2009. Condos continue to hold up well as buyers tumble down the housing ladder, HPI prices posted a 13% increase from May 2017. Klump’s theory stacks up well with recent data which suggests fringe borrowers are being pushed towards the private lending space, particularly in Ontario. Mortgage originations at private lenders in the Q1 2018 rose to $2.09 billion in Ontario, a 2.95% increase from last year. The market share of private lending went from 5.71% of originations in Q1 2017, to 7.87% in Q1 2018, despite originations at other channels dropping.